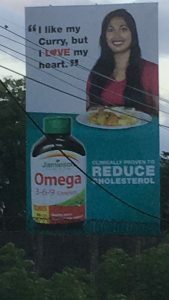 The Omega 3-6-9 Complex advertisement on the nation’s highways of Trinidad and Tobago and now on TV, is an out-of-place, outright attack on all curry lovers. Indeed, it is an ethnic form of aggression on a group of people in multi-culinary Trinidad and Tobago. The caption is accompanied by an Bharatiya woman with two tresses of long, flowing, black hair. She is serving a plate of parantha “buss-up-shut” roti with pumpkin, curried channa and aloo, curried chataigne (breadnut) and curried mango. Curry powder is made from a blend of natural spices such as coriander, turmeric, ginger, cumin, fenugreek, nutmeg, fennel, cloves, tamarind, cinnamon, cardamom, chili peppers and curry leaves. On the other hand, Omega 3-6-9 is made from chemicals manufactured from fatty acids and fish oil and coated with gelatin sourced from beef. A review of the potential medicinal benefits of murrayakoenigii (curry leaves) in dyslipidemia was done by Mamta Parnami and Dr Kanika Varma of the University of Rajasthan in Bharat. Their review was published in the International Journal of Advanced Scientific Research and Management (2018). Dyslipidemia is defined as an elevation of the total cholesterol, the “bad” low-density lipoprotein (LDL) cholesterol and the triglyceride concentrations, and a decrease in the “good” high-density lipoprotein (HDL) cholesterol concentration in the blood. Dyslipidemia is an important risk factor for coronary heart disease (CHD) and stroke. Parnami and Varma also reviewed another study in which 40 post-menopausal women 45-65 years of age, with hyperlipidemia, were given with dried curry leaf powder (5 gms) added to their main side dish during lunch for 45 consecutive days. At the end of the experimental period, there was a decrease of about 31.4 mg/dl TC, 15.9mg/dl TG, 23.8 mg/dl of the “bad” low-density lipoprotein (LDL) cholesterol. It was also observed that there was an increase of 6.5 mg/dl in the “good” high-density lipoprotein (HDL) cholesterol concentration in the blood.